As you know, last month we featured several stories on national police week. From that, we have one special story which relates to the gentleman we featured prior, Starr Thompson. 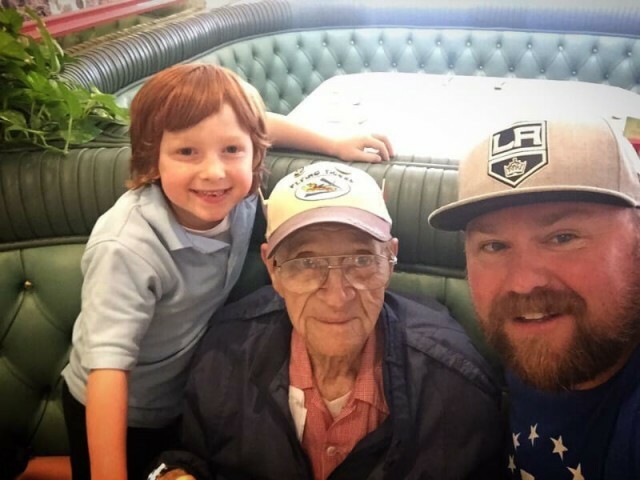 In case you missed it, Starr Thompson is a 95 yr old widowed, WWII veteran, who by mere chance encounter, befriended a 7 year old boy named Chase and his dad, Dan Borgstrom one day, while at lunch. Dan and Starr immediately made a connection and have become dear friends ever since; meeting each week for lunch, life lessons and a few good jokes. One day during lunch, Starr told Dan talked about how his dad had been a policeman, back in their hometown of Tuscaloosa Alabama. He told of how he was killed by vehicle theft suspects, in 1923, when Starr was only 3 years old. Dan, having been a 3rd generation policeman himself, immediately took interest. Starr shared with Borgstrom how he never really knew much, nor did he have anything of his fathers, by which to remember. That’s when Borgstrom sprang into action. An incredible story, over 90 years in the making. The bond of the brotherhood knows no limits, and knows no time. The work that was put into getting this done for Starr, on behalf of his deceased father, is a testament to that commitment of honoring our fallen, their families and the hurt which never fades, even after 90 years, two wars and a lifetime of service. Continue to hold the line, honor the profession and those who’ve paid the ultimate price.